Generally i am not a yellow kind of girl, i think i have changed. 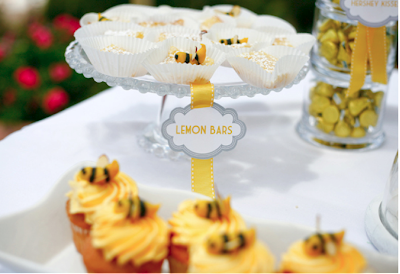 Firstly there are the cakes and lollies, the ribbon is stunning and the little bees... Well it's all just too fabulous if you ask me. Love this stuff, makes me inspired and happy. that could be my perfect wedding party. i'd love to have a summer party like this! Yellow is so summery and happy and these images show that .....I'm feeling happier by the minute !!! As mellow as the yellow in these images, lovely! 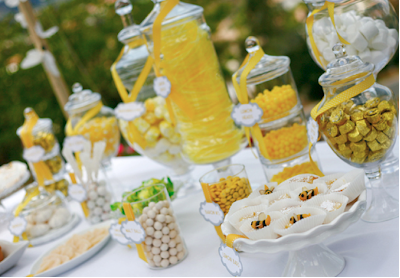 love the idea of a treat table... wish I would have done that at my wedding! Very bright and cheerful, makes me happy too! 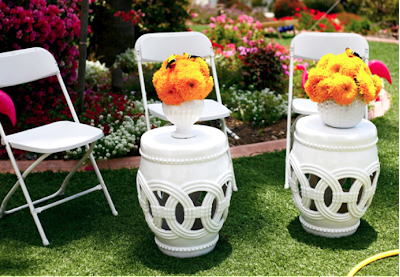 Oooooh, I love the garden stools in the last picture - so dainty! It's amazing how going for a monochromatic color scheme can make just about anything sophisticated and fabulous. 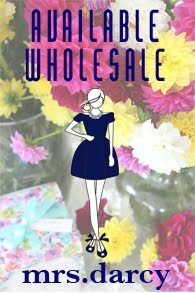 Love the candy jars and the labels in particular! I couldn't agree more..., yellow is summer and just such a happy and lighthearted color. Yellow is such a happy colour. I never cared much for yellow either until recently. Now I think it's so fresh and summery. Love the first image - everything looks so carefully styled. I have to say that yellow is my favorite color...soooo that should say it all! Yummy and creative...looks like a great party on a budget! YUM!!!! lovely and yummy post! Yellow is becoming a favourite color like never before- for me! oh, I love yellow so these are all fantastic! I'm not much of a yellow person, but done is a certain way, like this, I just adore it!! It makes me so happy!! 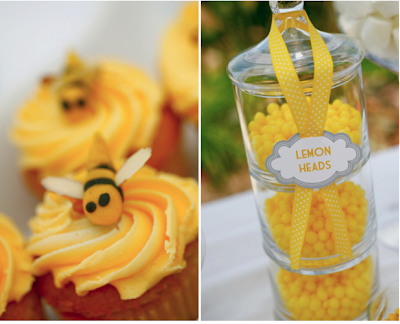 The bees, daisies and lemon heads are just awesome! I want to go to a garden party JUST like this! 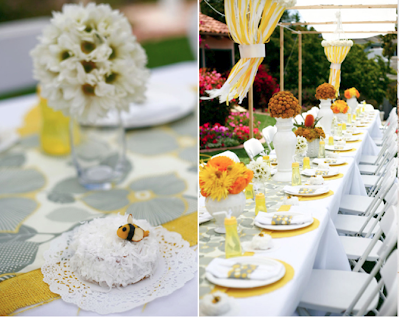 My mouth is watering for those cupcakes and lemon bars...and the table setting is pure heaven! just beautiful... i imagine butter-coloured vintage bridesmaid dresses and guys in grey suits and bare feet. That is, if it is a wedding! so much inspiration! I am already gathering ideas for my 30th bday...next year, ha! yellow outdoors is always a winning choice -especially in such sunlight. what a wonderful theme. A few years ago Oprah brought out yellow handbags to share as a fave before many people had them in lines- they grabbed me then and I still love a pop of yellow. So cheery- like the photos you featured. Happy color! Lovely Kelly.. we could almost pretend summer was here!! Happy colour and images! I keep thinking it must be summer there! Lovely lovely photos. I too am now embracing yellow... it was always orange or pink (or orange and pink) but never yellow. Room for them all! I love the colour yellow and these pictures are just gorgeous! Thanks for sharing! Pretty! Wish I'd been invited! I'm with you on the yellow - I never used to be a yellow girl but nowadays I just can't seem to get enough of it. well this makes yellow look good! This type of yellow is gorgeous! The styling is beautiful yet again. So much lovely inspiration! So happy and cheerful!! Love it!! Out of this world - DIVINE!